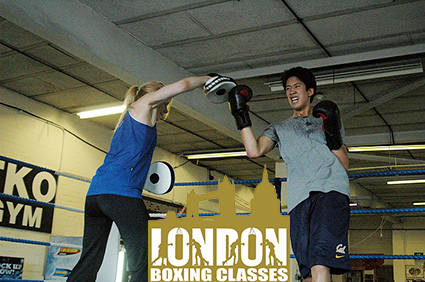 Professional Boxer and Licensed Professional Boxing Coach Marianne Marston, who received the accolade of “London’s Best Personal Trainer” by Time Out Magazine, is now offering Boxing based Personal Training at the PT Workspace in Islington, including throughout the Festive Season. Boxing is one of the toughest sports in the world – whether you compete or not. Boxing engages every part of your body – arms, shoulders and core are obvious, but fast reflexes and thinking as well as strong legs are essential to make the rounds. A boxer needs speed, strength, balance, agility, explosive power and endurance, and the training encompasses all these aspects of fitness, making for a well-rounded athlete. Boxing is not just about brute force and testosterone, it is a skill where there is always something more to learn; and learning a sport rather than just sweating the circuits makes training so much more satisfying. Having said that, after a stressful day at work there is nothing sweeter than pounding the bags! So whether you’re bored of doing the rounds of the machines in the gym, (or can’t even bring yourself to subscribe to the mindless tyranny of the treadmill) or have hit a fitness plateau you want to break through, learning a new sport stimulates the mind as well as the body (mens sana in corpore sana) and makes the training go so much faster. Marianne’s One-2-One sessions are a true professional boxing workout that includes many of the techniques, exercises and boxing drills that Marianne herself and other top flight professional boxers use in their training and competition preparations. As the One-2-One personal training sessions are tailored to your individual needs, they are suitable for all regardless of fitness level.